THE majority of housing providers are considering options such as sharing services to help maximise efficiencies within their organisations – according to a survey conducted by law firm, Harper Macleod LLP, at its National Housing Conference in Dunblane on Wednesday 8th November. Pooling resources was deemed a likely option for the future with 91 per cent of respondents saying they would be likely to share services with other organisations. Eighty-nine per cent also believe more RSLs will come together through constitutional partnerships and group structures in the short to medium term. The most popular reason given for entering a constitutional arrangement was to help improve services to tenants and other stakeholders. The results backed up comments made during the conference by keynote speaker – Housing Minister, Keith Brown MSP – who encouraged housing organisations to be innovative in delivering services and in developing new houses, in order to maximise available resources. He commented: “The challenges we face at this time are unprecedented and we need new innovative ways of addressing the needs of the people of Scotland. “Increasing the supply of affordable homes remains a top priority of the Scottish Government. It is a vital part of our efforts to build a fairer Scotland by continuing to address homelessness and affordability issues and regenerating our most deprived neighbourhoods. “If ever there was a time for working collaboratively on new and innovative ideas, that time is now. “Despite the severe cuts by the UK Coalition Government, we recognise the role that investment in housing can play in driving economic growth and supporting jobs. The survey also revealed that 79 per cent of respondents believed a case could be made for paying RSL board members in order to attract people with the necessary skills. In addition, the majority (66 per cent) of people surveyed said ‘no’ when asked if a Registered Social Landlord could only attract a full board containing the necessary skills and experience through elections from the organisation’s membership. Derek commented: “While it is not for us as lawyers to have a view on whether our clients should or should not pay their board members, it is interesting to note that respondents to the question would prefer to have the option to pay their board members. The 12th National Housing Conference was attended by more than 120 delegates -made up of housing associations, local authorities, developers and funders. 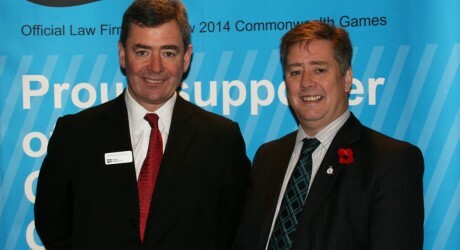 Picture caption: (left to right) Professor Lorne Crerar, chair of Harper Macleod and Housing Minister, Keith Brown MSP at the National Housing Conference.